The SCRUBTEC R 4 is one of the most versatile platforms in our range, suitable for different kind of areas and applications. This range is our smallest ride on scrubber dryer. The units are compact and superbly manoeuvrable and meet the demand for providing productive and efficient cleaning. Perfect for use in warehouses, industry, garage/car facilities and manufactoring. 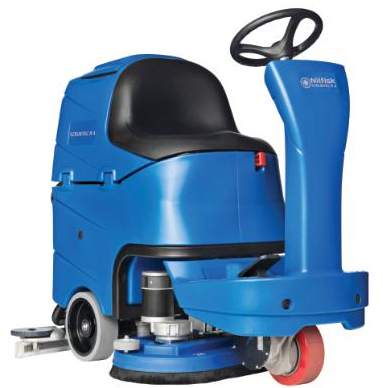 SCRUBTEC R 4 is very competitive, thanks to price, ergonomic, performance, innovation, features and reliability. The sound level is very low, and the ergonomic and compact design allows cleaning almost anywhere. Above all, the patented “Magic” deck system (linked to the steering wheel) means that the deck orientation follows the steering wheel to guarantee best cleaning performance leaving a dry floor with maximum comfort and minimum effort. This solution is so efficient that side skirts are no longer needed.